Are you a die hard Brooklyn Nets fan? This high-quality comforter set will put you right in the game! The comforter is made of polyester-jersey and is printed in true team colors. The pillowcase has a white on white print beneath the officially licensed team name and logo printed in vibrant team colors. Comforter Washing Instructions: Only wash in a High Capacity front-loading washing machine using the gentle cycle with cold water and tumble dry on low heat. Do not wash on a heavy cycle, in a washing machine with an agitator, or dry with high heat. A washer with an agitator will damage the comforter. High heat will cause the polyester jersey material and/or logo to melt. ... CONTENTS: One twin bed size comforter measuring 66 x 86 inches (168 x 218 cm). ; One standard pillowcase (the white one in the picture), with a finished size of 21 x 30 inches (53 x 76 cm) to fit a 20 x 26 inch (51 x 66 cm) pillow. 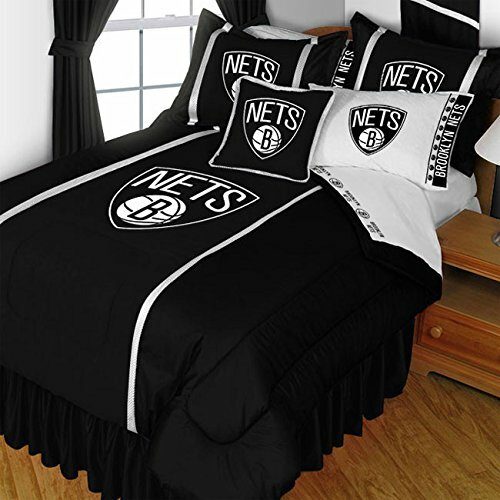 NBA Brooklyn Nets twin bed comforter and one standard pillowcase. Los Angeles Lakers 3 Pc FULL / QUEEN Comforter Set - (1 Comforter and 2 Pillow Shams) SAVE BIG ON BUNDLING! Cleveland Cavaliers 4 Pc QUEEN Comforter Set and One Matching Window Valance (Comforter, 2 Shams, 1 Bedskirt, 1 Matching Window Valance) SAVE BIG ON BUNDLING!